English is a global language. There is no doubt about that. In many countries around the world, you will be able to see English on road signs and in advertisements. An English-speaking tourist generally can find someone who speaks at least a little bit of English to help them with a menu or direct them to the consulate. Very often, even if English is the second language of all involved, it is still used as a common tongue to allow communication. Not all languages enjoy that kind of status in the world. Only a small percentage of languages have become world languages. Most languages aren’t spoken outside of the region where native speakers live, or perhaps in small immigrant communities across the globe. In fact, up to half of the world’s languages are spoken in such small numbers that they are considered endangered. According to the National Geographic Enduring Voices project, an endangered language is “a language likely to become extinct in the near future. There is no precise definition of when a language should be considered endangered. Instead, we have to consider a number of factors, such as the number of speakers, age of speakers, and attitudes of speakers.” One of these languages is Breton, a Celtic language spoken in the coastal province of Brittany in France. Breton is the only Celtic language that is not an official language, and is spoken by about 250,000 speakers, down from 1.3 million in 1930. About 66% of the current speakers are over the age of 65. Ordered with my very own version of French. I recently encountered Breton during my last vacation. We stepped off the surprisingly large, comfortable English Channel ferry at 7:00 a.m. into the little town of Roscoff in Brittany. I was delighted to finally be in France and had a hard time keeping the grin off of my face. 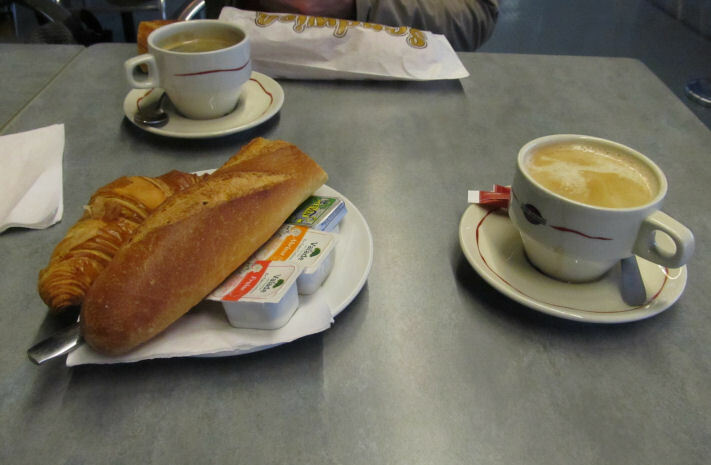 While certain the waitress at the port café would speak English, I insisted on ordering my first breakfast in French. Then, when the car rental window opened, I had a much better chance of practicing because the young man getting our car ready didn’t actually speak much English. I started to focus my energy on full engagement with the experience of living with the French language for the following five days. 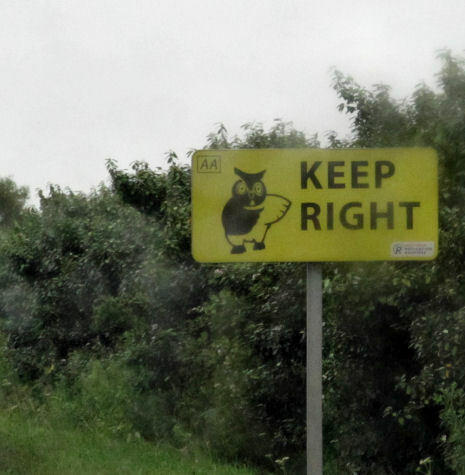 I'm not quite sure about the reason for the owl. This was interrupted abruptly during the first hour of our drive towards Normandy. First it was English, but at least they were interesting interruptions. There were numerous stores – some of them quite large – advertizing “Wine and Beer.” There were also road signs encouraging drivers to “Keep right.” I was so cognizant of being in France that it took me a few minutes to remember that I was still quite close to England. These signs were targeting the countless British tourists who can cross to France the way folks in the northern states of the U.S. hop up to Canada for the day. Then, things got interesting, at least on the street signs. Alongside the French, I saw other words: Moëdec, Huilieñ, Kentañ, St.Martin War-ar-Maez. I had completely forgotten about Breton – or Brezhoneg, as its speakers call their own language. My boyfriend was the first one to remember (he’s not a linguist, but to be fair, he’s been to Brittany before). Once he said it, some things came back from the recesses of my poor addled brain, but there were certainly more questions than answers. I kept looking for more evidence of Breton, but there was less and less the closer we got to Normandy. It seems we had left the main area of Brittany where Breton was the strongest. We were traveling east while the stronghold of Breton extended to the south. When we arrived at Mont St.Michel, my meager but exciting Brezhoneg adventure was over. Once we were east of the monastery, we were in the land of the Normans. In light of its history and current state, it was a wonder that I was able to have even the brief flirtation with Breton that I had. The language has been around since the 10th century, but never had official status. It is part of the Brythonic branch of Celtic languages and is most closely related to Cornish and Welsh (the former being extinct or nearly extinct). The Celtic people who remained in Brittany were under the control of first the Romans, then the Normans. French was adopted as the language of the elite and of the government. For most of its history, Breton was an accepted though not prestigious minority language, and in the late 19th century, it was banned by the French government. It was forbidden to speak Breton or teach it in schools. This ban lasted until 1951, which allowed limited instruction in schools. Signs using Breton under the French didn’t appear until the last 10-15 years. The language suffered greatly from the ban; according to the International Committee for the Defense of the Breton Language, in 1914, over 90% of the population of Brittany spoke Breton. Today, 20% of the population can speak it fluently, though this may be on the increase. For example, in Plounévez-Moëdec, one of the little towns we passed shortly after leaving Roscoff, 60% of the children are in bilingual schools, up from 50% in 2007. Is there hope for Breton, then? The speakers are getting older, but can new ones replace them? For years under the government ban, the Breton language and culture became stigmatized, even among its speakers. People fled to French in droves. Now, however, there seems to be encouraging news about efforts of bilingual schools to pass on the heritage of the language to new generations. Even young people are starting to embrace their Breton identity. Why worry about endangered languages? Sure, Breton is a funky language and interesting to read about, but what does it really matter if it eventually doesn’t survive and goes the way of the telegraph and the 8-track tape? After all, we now have cell phones and mp3 players, and they are much more useful and practical in today’s increasingly global world. So wouldn’t a global language be more practical? A little while ago, I wrote about the last two speakers of an indigenous Mexican language who couldn’t stand each other and so wouldn’t talk to each other. The reason that story stands out to me is because it is not just about the language itself; it is about the people who speak that language. This was not just the story of Ayapaneco, but of two men, both with their own personalities, experiences, hopes and desires, fears and worries, and how their deaths will bring an end to the language they used to express these aspects of themselves. Were there things they were never able to translate into Spanish? Did they think differently in Ayapaneco than they did in Spanish? Will we lose a way of knowing or learning about the world when we lose this language? I’ve said before that language is a window into the human mind and soul, and there’s so much that we don’t know that losing even one language seems like we’re throwing away evidence that can help us understand ourselves better. We’re discarding the very thing that might turn out to be a vital clue into the workings of human cognition and society. If we become so linguistically homogenized, will we lose some of the creativity and diversity not just in speaking, but in thinking? If losing just one language can have an impact, imagine how much we will have lost in 100 years when 3,000 more languages are gone forever. did you try any french macarons? What geek moment?! I’ll bet anything that my husband has probably visited that very museum–I’ll have to ask him tonight! I think your series idea is wonderful. I always learn something new when I read your posts. Have you looked into reserch grants for studying endangered languages, or anything similar? You really should be writing professionally. This is very cool. I love languages and think it’s very sad that so many are dying off. Thanks for introducing me to a new one! I am completely with your boyfriend too. Normandy would be an awesome place to visit, though I’d be more interested in the Ardennnes. Despite official repression in the later years of the 19th, and beginning of the 20th centuries, some minority languages ARE holding up in France. There are some Basque-medium schools over in the Basque country. We recently met someone whose child goes to such a school, because he is a Basque speaker, and his wife isn’t, so they want the family’s linguistic heritage to continue. Occitan is also under threat in South West France, but even though preserving it seems to be a bit of an academic pursuit, it seems everyone can sing well loved Occitan songs – ‘Se Canto’ and so on. Hope these movements to keep such languages surviving flourish! Those Celtic languages always seem such a mouthful! My husband went to university in Wales and he tells me that, even with three years there and a number of Welsh friends coaching him on the proper pronunciation of local village names, native Welsh speakers generally collapsed into giggles at his earnest efforts. I’m stymied by the phonetic paradigm that seems to come from a parallel universe. I hear what they say, and I see the way it’s written, and my brain keeps returning a disk error: does not compute. You might have read this article, but it made me think about this cultural loss as reading this did. I never saw that particular article, but I did see the film. There’s a local ‘art cinema’ a few towns over that showed the movie and brought in the filmmakers for a Q&A afterwards. It was really fascinating and sad at the same time. There are a lot of linguists who are trying (without film crews with them) but there’s only so much they can do to record and interpret some of the languages that are too far gone for revitalization. Thanks for the link! I’m going to save that article for my own files. I like the way he frames the argument and defends the languages. To be fair, I did say it was “extinct or nearly extinct” and while the existence of one speaker certainly disproves the “extinct” label, it doesn’t exclude the “nearly extinct” classification :) From everything I’ve read, one of the issues is how one would describe ‘extinct’. Are there any monolingual native speakers? Are there non-native speakers who have achieved native-like fluency? Is a language revived yet if there aren’t native speakers? I’m not trying to cleverly present my argument as questions; I’m just relating some of the questions that have been asked. It’s true that a revival of Cornish is underway, but some might still consider it a ‘dead’ language that some people still know (like Latin or Ancient Greek), but others believe that it never went truly extinct as long as there is a continuous presence. It’s quite an interesting case and something that might be compared to Hebrew, which some may argue was extinct but then successfully revived. It’s definitely worth some more research.